As the weather grows warmer and the days grow longer, some familiar faces will begin appearing in your yard. Migrating birds such as hummingbirds, sparrows, swallows, martins and larks will be returning soon, and it’s time to prepare your garden and yard for your feathered friends. Use a scrubbing brush and hot soapy water to clean debris from your wood feeders. 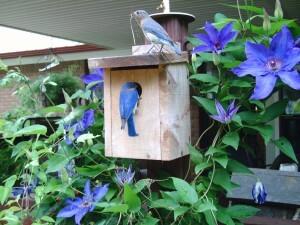 Do not use chemicals to clean wood feeders, as wood is porous and can absorb chemicals. For tube and hopper feeders, soak them in a mild bleach solution and use a brush to scrub out any seed or debris. A quick tip for cleaning out your hummingbird feeders: add a cupful of uncooked rice inside the feeder and then add a solution of one-part vinegar to four-parts water, replace the lid and shake vigorously. Once the feeder is clean, discard the rice and solution, then rinse and dry the feeder thoroughly. As you work in your garden, planting annual flowers will be beneficial to birds both in the summer (when they gather insects) and in the fall (when they gather seeds). But you can do more than just plant flowers. Berry-bushes, evergreens and other shrubs and trees offer both food and shelter for birds. Hang your hummingbird feeders early. When spring-blooming red flowers begin to blossom, the hummers may not be far behind. Clean up the area around your feeders with some fresh mulch to cover the winter’s accumulation of seed hulls. Offer a reliable source of water, such as a bird bath or fountain. Put up a bird house for those wrens, bluebirds and purple martins looking for a home. Nesting birds appreciate the extra supplies to get their nests started. Think about leaving a small pile of string, feathers, straw, pet hair or twigs in your yard. Even create a sloppy mud puddle that some birds will use for nest building. Follow these tips and you’ll enjoy the colors of spring at your feeders and the concert songs of the wild birds. This entry was posted on Saturday, March 10th, 2012 at 5:23 pm	and is filed under Articles, Bird. You can follow any responses to this entry through the RSS 2.0 feed. Both comments and pings are currently closed.